An elderly widower died after being knocked down as he crossed the road on his way to visit his wife’s grave, a court heard. Jack Richardson, 88, suffered fatal injuries in the collision on Flanshaw Road, in Wakefield, after being struck by Kelly Lucas. Lucas, 33, admitted causing death by careless driving over the tragedy which happened on June 30 last year. Leeds Crown Court heard Mr Richardson would have been in the road for five seconds and should have been clearly visible to Lucas, who was travelling at just 24mph. Allan Armbrister, prosecuting, said: “The Crown’s position is that she must have been distracted for the whole of that period but she failed to see him. Mr Richardson suffered serious internal injuries and bone fractures. Mr Armbrister said Mr Richardson had been a devoted husband until losing his wife Eileen in 2010. The retired education welfare officer was described as being very active for his age, playing golf every day and doing volunteer work. He also visited his wife’s grave twice a day, every day following his wife’s death in 2010. Robin Frieze, mitigating, said: “She (Lucas) has spent most of her time asking herself why she did not see him. “She has pleaded guilty at the very earliest opportunity at this court. 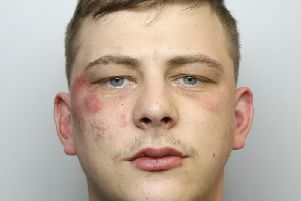 Mr Frieze said Lucas, of Broadowler Lane, Ossett, had been driving her boyfriend’s vehicle at the time. He told the court that Lucas had been driving slowly as she was not familiar with the vehicle. The barrister said Lucas, a mum of one, had been driving since she was aged 18. The court heard she had never even received a speeding fine or penalty notice and had no other convictions. Lucas was made the subject of an 18 month community order and told to do 250 hours unpaid work. She was also banned from driving for 12 months. After the hearing Mr Richardson’s son John, 69, of Flanshaw, Wakefield, said: “I’ve lost a father. “She is going to have to live with that for the rest of her life. Mr Richardson said his parents were inseparable. Mr Richardson said his father would make the hour long round-trip to the churchyard at St Paul’s, Alverthorpe, every morning and afternoon.